The net of all of that is that the Market is so oversold, and the rally so far classed as “Failed” in my eyes, especially after yesterday’s distribution day on a couple of the major Market Indexes. The odds are that we should expect at least a retest of the lows before we will either see it hold for a double bottom or breakdown further. You will agree that for there to be any signs of real buying enthusiasm we must see irrational exuberance as expressed by Eurekas…not one my buddy on the NYSE. In addition to that we need to see some Kahunas to show signs of excitement. We got a couple of Little Kahunas on 7/29 and 7/30 on the NYSE, but then it was followed by one to the downside and three black crows for candlesticks. Where are the five white soldiers? No cigar. 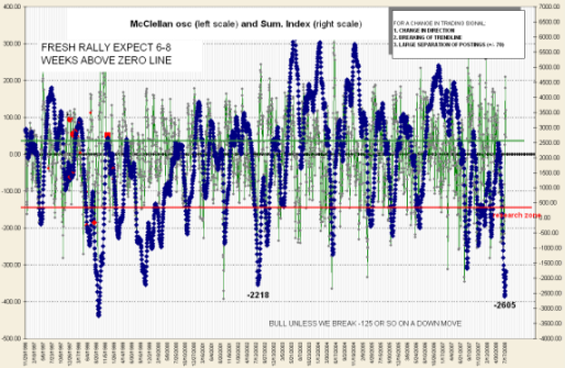 I am a biggie on the McClellan Oscillator and more importantly the Summation Index. We have not been this low since the Oct 1998 Asian Contagion, after which it took off like a rocket when the Banks banded together to solve the Japanese Financial run on the Yen, if my memory serves me correctly. 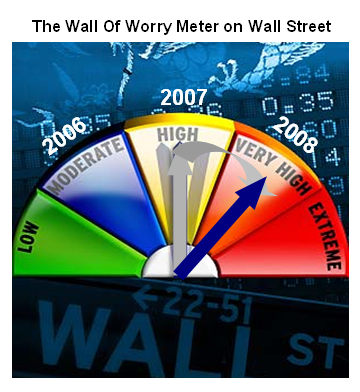 The message is it took a Catalyst of some good news to propel the market with vigor back then. We are lower this time around, with a reading of -2874 on July 16th, when the previous low during all the kafuffle from 2000 to 2003 was no lower than -2218 on July 26, 2002. On that occasion there was a bounce for seven weeks to 1294, only to fall back again for a month before it finally took off for a three month rally. We have currently cut the -2605 by half to -1390, but no where near positive territory as yet…again implying there is no enthusiasm from the Bulls, leave alone irrational exuberance. 4. Staying with the internals, the next thing to turn our attention to is the extent of the Accumulation versus Distribution in both the Industry Groups and the Stocks themselves, and this was the central focus I provided in my note on the blog. With that stake in the ground, we know that the %E’s hit the lowest ever recorded of over 34% a few weeks back as I showed in the newsletter. I have also proved that if the %E’s are greater than 17% when a rally attempt is launched, we will invariably get a failed rally on the FIRST attempt from such depths. That is precisely what has happened so far. 5. If we go by yesterday’s action all the old favorite commodity wolf packs are being trashed so that game is over for now. We then look for rotation and where do we see it…Health Care, a bounce in beaten down Financials, a bounce in beaten down Home Builders, precious little in Technology (until today). So yes there is money to be made in beaten down stuff but there is no beef. The bottom line is that there is NO real Leadership right now. 6. Throw in the slowing down of Global markets, with Europe feeling the pinch of a Recession, Japan never getting off the mat at all, and so on and so forth. 7. At times like these, one CANNOT separate the overall mood of the public from what spills over into all the talking heads discussions the various airways provide. The net bottom line is that the every day John and Jane Doe are fed up to the hind teeth with the increasing cost of living, and all the “fru-frau” about Oil. That, on top of the fact that the “Do Nothing Congress” has decided to go on vacation for five weeks and in effect run out the clock on what is the hot topic at every water cooler conversation and that is “To drill or not to drill…that is the question?” Net-net, throw all the bums out, and John and Jane Doe have learned now is not the time to be “playing the stock market”. 1. Oil down below $100 will stop the hubbub at the water cooler; just as I gave you the XLF at a critical juncture to watch a few weeks back, watch USO. We need to see it break down below 96 and fill the gap down between 95 and 94; and then make its way down to seek at least a low of 90. 2. Oddly enough I feel the Olympics could be a Catalyst as China becomes front and center for the next two weeks. You can rest assured there are background talks going on to reverse Wall Street’s downward slide that triggered a 40% sell-off in China Silverback Stocks, keep U.S. consumers buying China goods, and keep $1 trillion in U.S. dollar-based investments from free falling into an abyss, which in turn could rock the Chinese economy for years to come. 3. Continued calming of the Financial Markets with easing of the credit crunch and keeping inflation in check, with no further easing or tightening at this juncture by the FED. Net-net, we need a continued rise in the U.S. Dollar. Let’s hope one or all of these kick in before too long and we have some respite from the brutal weeks we have had. Editor’s Note! This was written last evening and e-mailed first thing this morning, and one never can tell with this tricky market. Maybe we have seen a turn-around from all the gloom and doom and have finally got a big day upwards to compensate for all the woes of the past week. This would be the one-two punch I was waiting for. We might even have a Eureka signal after tonight’s download to cap it off! Please refresh your memory with the targets I set for the Bear Market rally to be more than a Bounce Play in an earlier blog with the same picture written on July 19, three blog notes back…which Dave is referring to. The Market is still oversold and the Bulls feel it is time to try again, since the Bears have not collared this by the scruff of the neck this past week. My point is nothing is ever cut and dried. Next week should tell us which way the wind is truly blowing, although it points to #1. The reason I hesitate is that the INTERNALS of the market relating to Accumulation/Distribution have improved both for the Industry Groups and the Stocks themselves since July 19. When a Market is so oversold as this one is, the tide goes out so far that most boats are still stuck in the mud, and it sometimes takes a pull back and a second effort to take off on a rally…that is why 50% of the Follow Through Days (FTD’s) fail on the first attempt and then move up on the second shot. This is especially true in a Bear Market. It needs a one-two punch from the Bulls to drive it up, while at this stage of the game the Bears only need one punch from here to drive it down. Net-net, the Bears have the upper hand after two weeks of trying by the Bulls. That should give you enough to chew on for an immediate response, but I will give you more in a blog I will put up over the weekend, which will show you the good stuff “Under the Hood” that makes me hesitate to say the “Party is Over”, period. Since this note is buried in the comments section, I will resurrect it in its entirety to full view and repeat all this and add more in a fresh blog. As promised, here is the picture of the good stuff “Under the Hood”. Let me first set the context in which this picture gives a perspective of where we are regarding a successful or failed Bear Market Rally. This coming week should determine the outcome. The Color picture shows very well the phases of red, yellow and green in the Industry Group and Stock Distribution turning to Accumulation as depicted by the Columns showing Group A to E, and Stocks with Accumulation from A to E.
The cycle starts when the market has peaked and we begin the downward slide, depicted by Bingo signals showing the RSI (14 periods) dipping further and further down below a reading of 30 on the NYSE. Ultimately, the Market will find a bottom, and this is usually signaled by a final Bingo which is called the Capitulation Day in which the number of New NYSE Lows give a major spike from previous readings. In this case the number of New Lows shown is the number of stocks in the HGSI Software Database, but to all intents and purposes you can see that the number of 1019 is almost double that than the previous day and it falls off dramatically the day after that. One can’t help but notice the spike, and that is the first sign that the Bulls have thrown in the towel when it is a day of fear, and the VIX rises dramatically, usually spiking to a high. Invariably, the day’s Low will be a long spike down (a Tail) on the candlestick with the Market Close finishing much higher as the market decides to rebound. If there is a true rebound then this Capitulation is quickly followed by a huge Reversal Day where the Nasdaq will deliver at least a 2.2% up day in Price gain, and in this case it was 3.1%, as shown on the above spreadsheet. Once we have a Reversal Day, the next item to look for is a Eureka Signal which shows the Bulls are in earnest and demonstrate “irrational exuberance” by clocking up at least 3:1 advances versus declines, 5.4:1 in Adv Vol to Dec Vol, and an ARMS reading of <0.6 on the NYSE, which as we all know is very bullish. These Eureka signals invariably appear within 12 days of the Reversal Day and there are at least two or three of them for good measure. Meanwhile, we also keep a beady eye out for what has become known as the Follow Through Day (FTD), where the Nasdaq again delivers a strong up day both in Price and Volume. My work has shown that the “odds” of a FTD being successful is no more than 50%, i.e., a toss of the coin, and this is especially true in a Bear Market. As I show above, any distribution day that occurs within 5 days after an FTD diminishes the probability of a successful follow through day. My thanks to Mike Scott for this information. After day five following an FTD, the probability of success increases if there has been no distribution and as the picture shows, we will not have reached that state until Tuesday of next week. The final and most important requirement for a successful FTD is the need for the NYSE New Highs to get above 100 and then stay above 150 while the New Lows diminish to less than 50 (say). After a Capitulation Day expect a Reversal Day, and then a Follow Through Day within three to nine days. 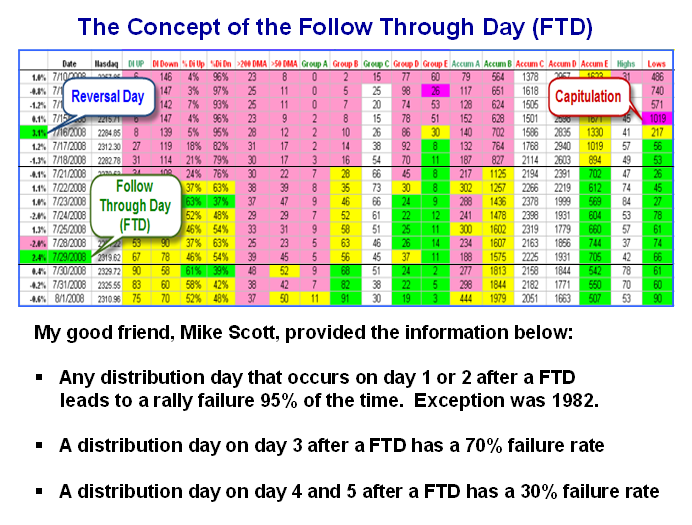 Once you have a FTD, there should be no distribution days for five days thereafter. 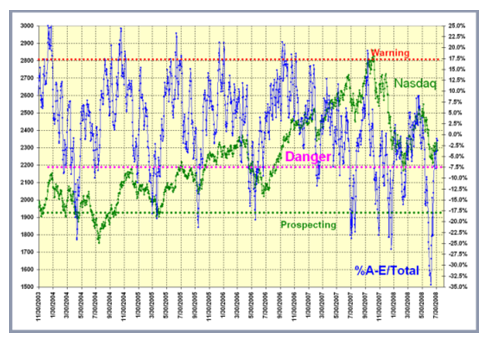 Eureka signals should register within 15 days of a Capitulation Day and if not the rally must be regarded as suspect. New Highs on the NYSE must exceed 100 to 150 while New Lows go down rapidly to less than about 50. If any of these rules are violated it is probably a failed rally, and little more than a Bounce Play that will invariably end in a retest of the recent low to provide a double bottom or worse yet searching for a lower bottom. 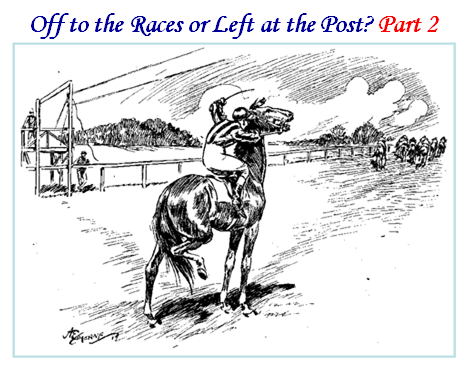 As my friend Dave reminds me a strong clue that all is not well, particularly at this time of earnings reports, is when stocks deliver strong gains but there are failed breakouts galore or the stellar results are ignored and the stocks are pummeled. The worst clobbering occurs when the results are reasonable but the guidance for the following quarter and/or year is lowered.